This 3-in-1 TV/FM tuner video capture card is the perfect solution to expand your desktop PC with TV function, video recorder, and FM radio function. It transforms your desktop PC into a full-featured multimedia station with video/audio/radio input for all regions. This PCI TV/FM tuner DVR card has an universal TV tuner built in to decode both analog basic cable channels or UHF/VHF closed-circuit channels for all countries in the world using NTSC, PAL B/G/D/K/H/I, PAL-M and PAL-N for TV broadcast standard. Users can record TV shows instantly or by advanced scheduling PC hard drive. The bundled TVR software provides users with various DVR functions so no more missing out on favorite TV show ever again. This TV/FM tuner card also provides RCA video input so users easily capture video or audio feeds from VCR/DVD player, game console, CCTV surveillance cam into digital MPEG formats for visual aide, presentations, training and all other multimedia projects. 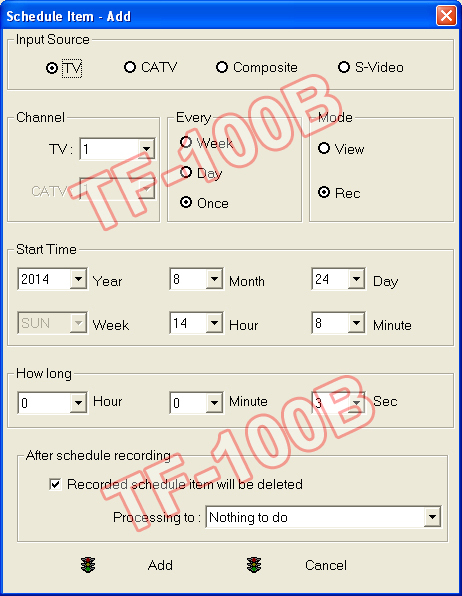 This TV/FM tuner DVR capture card supports Windows OS including Win8.1/8, Win7, Vista and XP. [Note]: Windows 10 is not supported. The RF input of this TV tuner card supports worldwide analog TV RF frequencies including NTSC, PAL B/G/D/K/I and PAL M/N TV systems. It works for all regions in the world and able to decode all standard UHF, VHF and analog cable TV channels within the range of 48.25 to 883.25MHz or from CH1 to CH139. 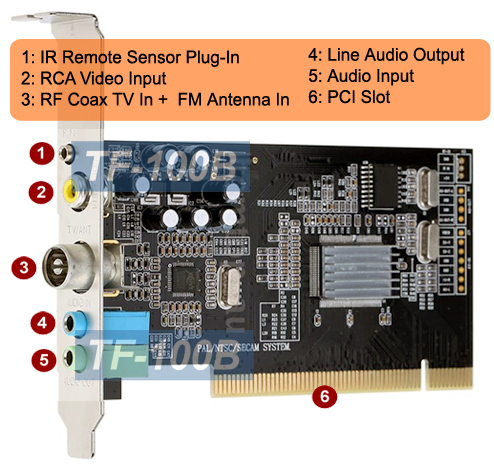 This PCI TV FM tuner card is also a low cost RF TV decoder solution. It can decode RF modulated signals from devices such as cable box, DTV converter, closed circuit channels into digital MPEG format for viewing or recording through desktop PC. The RF input of this adapter card can also be used for those satellite receivers with TV2 out from DirecTV, Dish Network or other free-to-air satellite box for all regions. 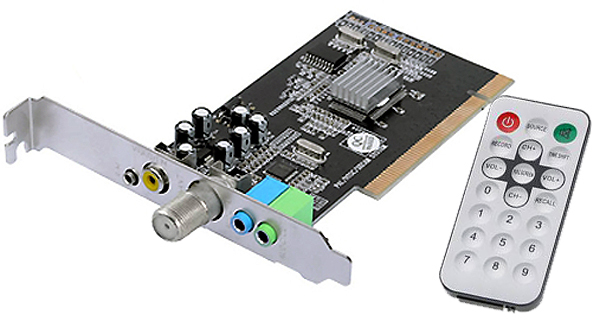 This PCI TV video capture card is featured with RF coax input, composite RCA input, 3.5mm mini input and a FM antenna input. The composite RCA video input of this TV video capture card allows users to connect video devices such as DVD player, VCR, camcorder, game console to your desktop PC for viewing, recording or digitizing analog video feed into digital video files for visual aide, presentations, training, disc production and all other multimedia projects. This TV tuner card also doubles as an advanced PC-based digital video recorder for recording standard RCA video audio feeds from any A/V device like satellite receiver, DVD player, VCR, camcorder, video game console, CCTV camera, etc and store the recorded content into the hard drive for playback or further DVD production. 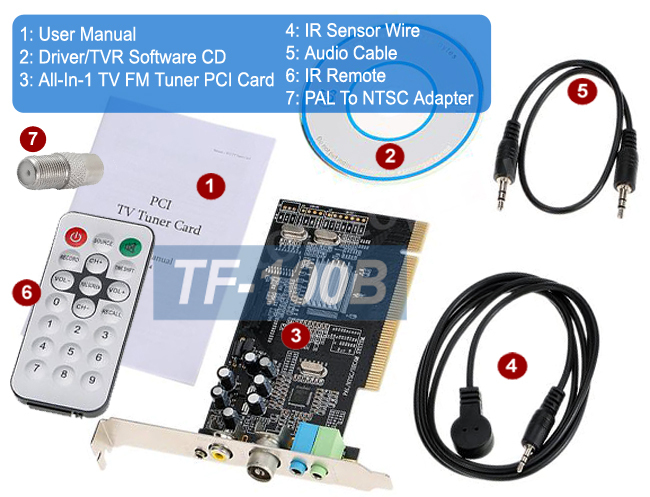 This PCI TV FM tuner card has bundled with easy-to-use TVR recorder software, which has very simple and interactive interface for users. Instant Recording: manually start the recoding of CATV, CCTV, MATV or video played from home video device at any moment. Scheduled Recording: arrange the recording for analog cable TV programs with advanced scheduling on any particular day, daily or weekly. FM Radio Tuning/Recording: manually tune into local FM station and start the recoding of favorite FM music or radio station from desktop PC. This TV tuner capture card is also a great tool for digitizing their analog video contents into digital formats as files for archiving personal video collection. Users can import the video feeds from camcorder and convert the older V8 or Hi8 tapes to digital MPEG or DVD format before further disc production or creating high impact multimedia content. This device also supports PIP function, meaning that users can browse internet or work in the computer while watching TV, DVD or recorded video playback at the same time. The TV video screen will be always on top of the computer screen. Once starting up the TVR software, a video window will be inserted onto the computer screen. This video window can be relocated to any location of the computer screen and the screen size can be adjusted at will and up to full screen display. This all-in-1 PCI TV/FM Tuner DVR card is also a simple and fast DVR solution for displaying live camera pictures on a desktop PC screen without using a TV or video monitor. Users can connect any type of video cams such as CCTV surveillance camera, wireless camera, microscope camera or camcorder into this PCI adapter card so they can start seeing and recording camera feeds into hard drive for playback later, web broadcasting or burning onto disc for storage. The power-off button on the remote of this TV tuner card allows users to safely exit Windows and turn down the PC. No need for clicking the mouse around. Users may also set up in the TVR software about when to shut down the computer automatically so you can walk away from your computer and do your errands. 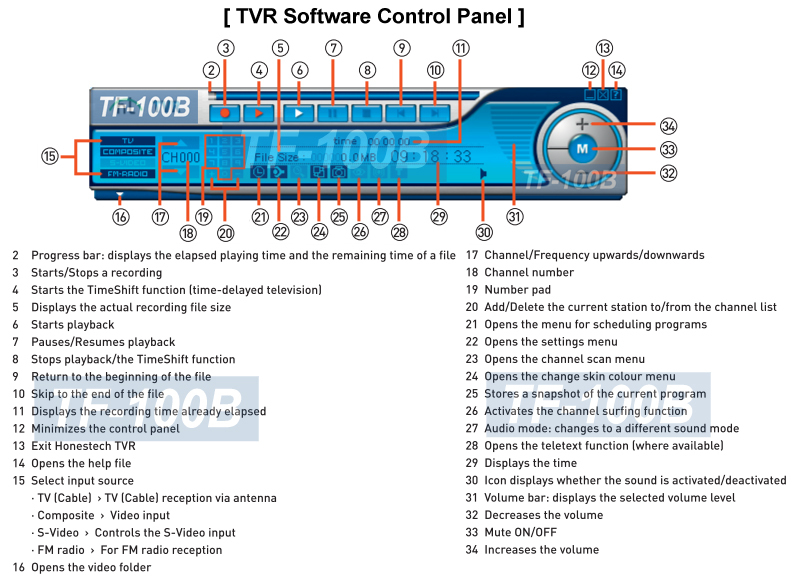 This universal TV tuner DVR Capture card has a full-featured FM radio tuner module built in. Users can enjoy listening and recording their favorite local FM radio stations while working in computer. FM radio tuning can be controlled by the enclosed TV remote by switching to FM Tuner mode. FM antenna wire is also included in the standard package for enhancing the reception. The supplied TVR software provides an easy intuitive interface for tuning, seeking, scanning and recording favorite FM shows or music into digital WMA files for playback or transferred to a CD disc or multimedia player device for playback. Premium 3-In-1 PCI card combining analog TV Tuner, digital video recorder, FM radio tuner function into one card for multimedia platform used in desktop PC. Universal TV tuner for worldwide system upport of NTSC, PAL B/G/D/K/H/I, PAL-M and PAL-N standards. Full-featured FM radio tuner built in so you can enjoy listening and recording favorite FM radio stations while working in computer. Advanced PC-based digital MPEG video recorder. Excellent RF to PC converter solution for analog cable TV, satellite receiver or video modulator. Supports multiple inputs including RF coax, composite RCA and FM antenna input. Captures or converts analog video/audio into PC in digital format for storage or disc production. TVR Scheduling allows you to use PC for auto recording of your favorite TV shows just like a DVR. Records basic cable, satellite receiver, DVD player, game console, CCTV cam into PC for playback, editing, etc. Movable and resizable TV/Video windows on computer screen. Supports Picture-On-Picture so TV/Video window can always stay on top of computer screen. Supports 16:9 and 4:3 ratio for the sub video window size. Supports Time-Shifting function to pause, rewind, and fast forward live TV, replay a scene or skip the commercials. 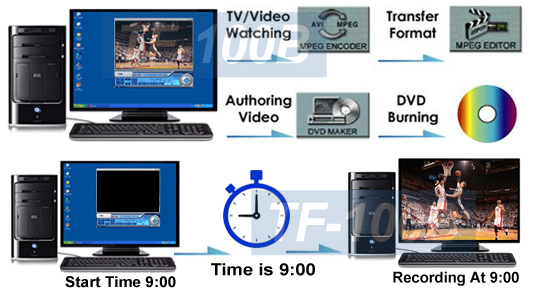 Real-time video recording in MPEG1 or MPEG2. Maximum recording resolution at 720x480 pixels @ 30 fps for NTSC or 720x576 @25 fps for PAL/SECAM system. Advanced scheduling for automatic recording of any TV program on weekly basis or one-time only. Supports closed captioning for cable TV channels. Supports snapshot function to take screenshots still pictures with ease. Full-function IR remote included for easy operation. Auto shut-down your PC per scheduled timer set in the software. Listens or records local FM music in WMA format while working in computer. Supports Win8.1/8 (32/64-bit), Win7(32/64-bit), Vista, XP. Video Color Element Control: Adjustable video color elements for picture brightness, contrast, saturation, hue.